Each month, the APA features one randomly chosen member; Tomahawk Development has been chosen for November. We hope you can use these brief overviews to learn more about your neighbors and reach out to network and create relationships that help you grow your businesses. 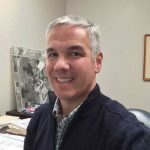 Mr. Lathrop, who handles the bulk of the marketing activities for Tomahawk’s buildings, is a licensed real estate broker in the State of Ohio, and also represents buildings owned by partners of Tomahawk. Currently the company is orchestrating renovation of 480 W. Dussel, the former Andersons’ headquarters into suites and hopes to complete the project in early December. He is excited to show off the renovations and new common areas. Currently, Tomahawk Development occupies a storefront in Arrowhead Shops, at the corner of Holland and Dussel. The office has occupied many places in Arrowhead Park over the years, moving as clients requested the space. He has found the 4 years in this location convenient because it is easy to find and minutes from each of his Arrowhead clients. Tomahawk’s primary focus today is managing the buildings in inventory and keeping tenants happy. 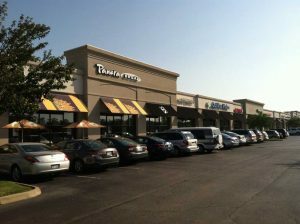 He reports that he has some nice storefronts available in Suffolk Square Plaza (Dussel and Ford), and is looking for flex tenants for Arrowhead Corporate Center. These versatile units vary from 3,200 to 16,000 square feet, and have and offices in the front and a warehouse in back. Tomahawk also manages Arrowhead Shops and many other properties. Because the founders of Tomahawk were like family to each other, the company retains that family business flavor. Mr. Lathrop feels he is personally representing the well-known families in Northwest Ohio who banded together to create Tomahawk Development, and approaches tenants from a family standpoint to this day. “Making sure that the tenants are happy is important” says Mr. Lathrop, and he makes that the focus of the business. If you know of a business which would be a great fit in Suffolk Square or Arrowhead Corporate Center, reach out to George Lathrop today.